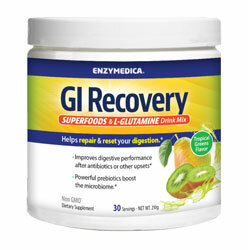 GI Recovery, by Enzymedica Inc., is an innovative drink mix designed to help reset the body's digestive system, boost the microbiome, and promote improved energy, muscle growth, and total body wellness. The Digestive System is the core to our health. When it has been assaulted with antibiotics or other aggressive medications, it is important to restore its normal function quickly. Prebiotics are well known for their ability to promote healthy bacterial growth. Prebiotics are most often non-digestible, but fermentable dietary fibers. These compounds can act as a fertilizer for the healthy bacteria in the gut. Enzymedica's GI recovery is a next generation prebiotic formula. It contains an incredibly wide range of diverse prebiotic compounds that support, promote, and nourish microbiome diversity. L-Glutamine gives fuel for cells along the GI tract, promoting energy, gut function, and muscle growth to support recovery from digestive distress. Organic Gum Acacia provides unique prebiotic fibers that support regularity and keep the digestive system moving efficiently. Galacto-Oligosaccharides help establish a healthy microbiome. Millions of microorganisms within the human body play crucial roles in overall health and wellness. The organisms, collectively referred to as the microbiome, function in balance and harmony to influence a variety of the functions of life, including digestive, immune, and mental health. When this balance is disturbed, the impact on the body can be unexpected and far reaching. Modern medicine has eradicated many diseases and common health concerns, but sometimes these treatments come at a cost. Antibiotics, chemotherapy, and many over the counter medications all serve unique purposes, but wreak havoc on our digestive tract and upset our microbiome balance. Other Ingredients: Natural kiwi flavor, citric acid, Reb A (Stevia Extract), citric acid. Contains NO: gluten, milk, casein, soy, egg, artificial colors or flavors. Suggested use: Mix 1 tablespoon of powder with 8oz of cold water. Drink once daily. Caution: Consult with physician prior to use if pregnant or nursing.